State Level Science Fair SLPECs Dates, Venue, TS State Level INSPIRE Science Exhibition Project Competitions Dates, Venues 2018: The Director, SCERT, Telangana has given the proceedings for Conduct of State Level INSPIRE Science Exhibition and Project Competitions 2018 at Siddipet district and Dates and Venue are declared on this subject, In this regarding Certain instructions and Guidelines have been issued. The instructions and details as follows. SCERT TS Rc. No. 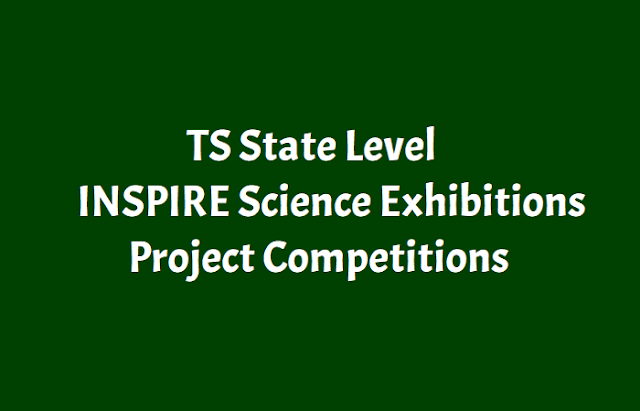 440: SCERT, Telangana, Hyderabad - INSPIRE Award Scheme - Conduct of SLPECs -venue & dates for SLEPC in the state. The attention of the all District Educational Officers except erstwhile Adilabad district in the state is invited to the subject cited that, the following dates & venue have been identified for the State level Exhibition & Project Competitions 2018. Instructions: The District Educational Officers except Adilabad are requested to inform the above details to all the district level selected awardees to participate in the State level Exhibition & Project Competition duly following the instructions as detailed. 1. The list of awardees selected at the respective districts shall be counter signed by the district chairperson I district nodal officer. 3. Proper instructions and guidelines are to be given to the awardees and to the guide teacher and they are requested to improve the exhibit before presenting them at State Level Exhibition. 4. Project reports of the individuals are to be submitted in the proforma communicated to them i.e., the proforma should contain the photograph already of the candidate (3c.mx3c.m) and details of the candidate along with 200 words project report. 5. Candidates without warrant number will not be allowed to the state level exhibition at any cost. 6. A Senior Headmaster/MEO/Dy.Ea should accompany a batch of 25-30 participants. 7. All the candidates who participate in the state level exhibition shall be informed to register their names and exhibits one day before the actual commencements of the exhibition i.e., on 24-11-2018 after 2.00 P.M onwards. 8. TA and incidental charges for the INSPIRE Awardees and TA & DA to accompanying teacher (as per TSTA norms) shall be met by the respective District Educational Officers from INSPIRE funds (accompanying parents if any in the case of Physically Challenged may be paid their actual travel expenses). 9. Senior official who is representing the district shall bring the selected awardees write-ups proforma already communicated to them i.e., the proforma should contain the photograph of the candidate (3c.mx3c.m) and details of the candidate along with 200 words project report in MS-Word in Pendrive should be handed over to the registration committee at the time of registration i.e., on 24-11-2018.
i failed in maths paper for d.ed. when will be the supplementry exams.